When the guys over at Backblaze decided they wanted to do a startup that offered unlimited cloud storage backup for just $5/month, they knew they were going to have to come up with something. Data storage providers like Amazon S3 were just way too expensive, so what did Backblaze do? They started building their own storage pods out of commodity components. 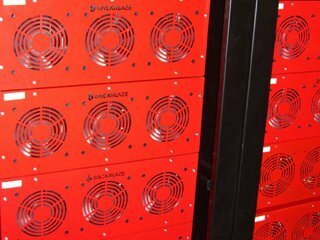 It costs Backblaze about $117,000 to build a Petabyte cluster, while at the same time, other providers like Amazon and EMC pay almost $3 million dollars for the same amount of space. Backblaze also gave away the design specs for these storage pods, open-sourcing them, so anybody interested could build one. Gleb Budman, CEO of Backblaze told us the company has seen quite a bit of people interested in building their own and hopes, "if they share their ideas on how to put the systems back into the ecosystem, we may very well take those ideas and improve on our systems." The startup which hasn't received any funding said it is seeing significant trantion: Backblaze has three petabytes of storage and is adding half a petabyte of storage per month for new users that sign up. To put this in perspective, Budman told me all of the photos on Facebook take up about 1.5 petabytes. In this episode of Startup Sessions, Gleb shows around Backblaze, dissects a storage pod for us, and takes us up into the clouds where all the pods live.